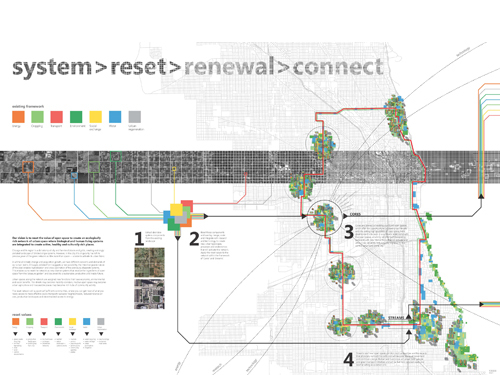 MAS Studio, along with the Chicago Architectural Club, organized NETWORK RESET, an international design competition to rethink the Chicago Boulevard System. 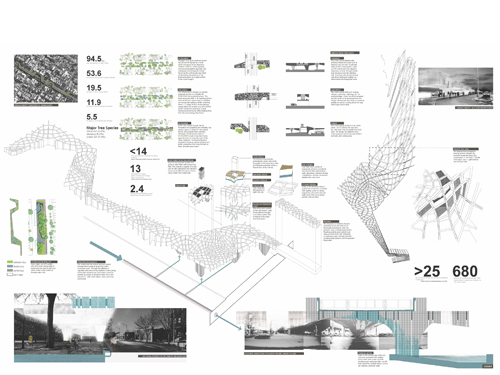 With proposals received from all over the world, here you will find the winning entries as well as the honorable mentions. 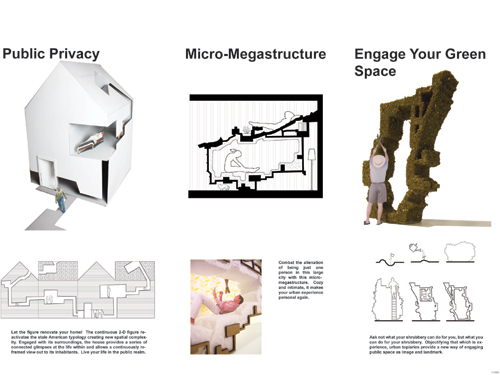 Earlier this year, the design studio MAS Studio and the Chicago Architectural Club organized the competition NETWORK RESET. 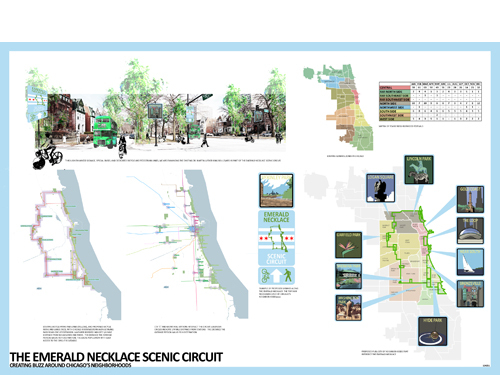 Sponsored by Adrian Smith + Gordon Gill Architecture LLP, the international competition sought to provide ideas and actions that could reactivate the Boulevard System of Chicago and rethink its potential role in the city. Proposed by John S. Wright in 1849, the system was envisioned twenty years later when the State Legislature established the South, West, and Lincoln Park Commissions. 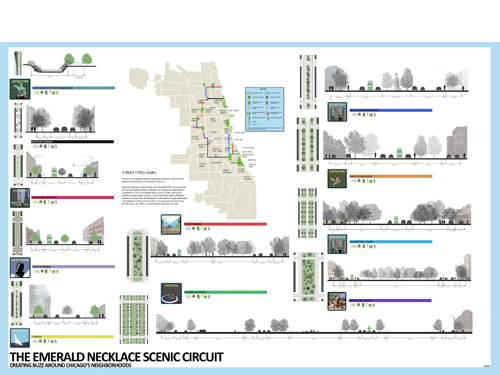 Also referred to as the “Emerald Necklace” since the 1893 World Columbian Exposition, it is composed of a series of streets and parks, some of them designed by Frederick Law Olmsted and William Le Baron Jenney. 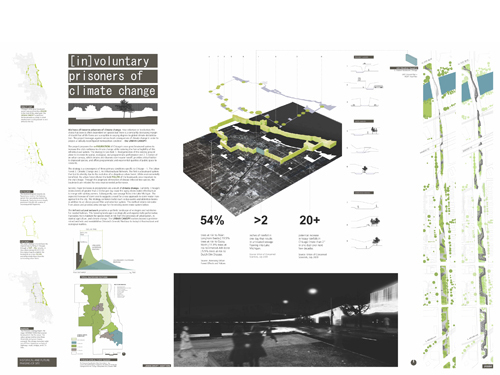 After the mid-twentieth century, the lack of proper funding, the split of management of the system as a whole (parks would be managed separately from the streets) and the migration of residents to the suburbs were some of the circumstances that accelerated the deterioration of the system. 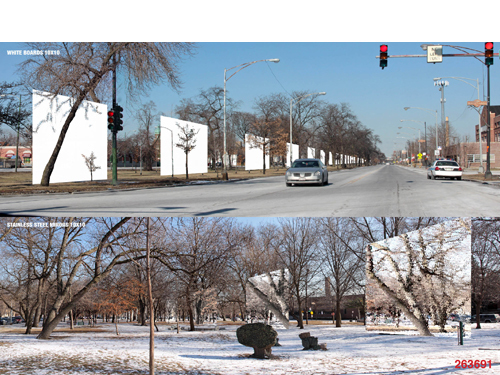 While portions of it, such as the Logan Square Boulevards District (an official city landmark district since 2005) still maintain the original character, other parts have just become underutilized areas and oversized streets that act as barriers within neighborhoods. 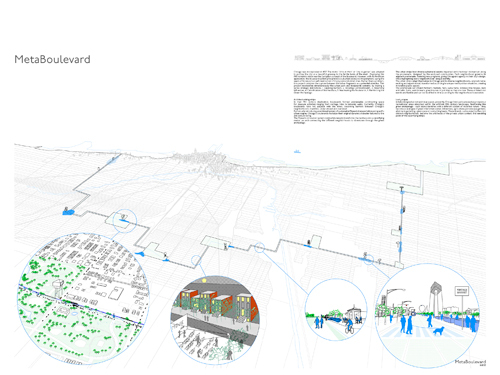 Given the current situation of the system, the competition asked participants to look at the urban scale and propose a framework for the entire boulevard system as well as provide answers and visualize the interventions at a smaller scale that can directly impact its potential users. To be able to do that, they had to ask themselves a series of questions: What if the system becomes a new transportation corridor in the city? What type of transportation would that be? 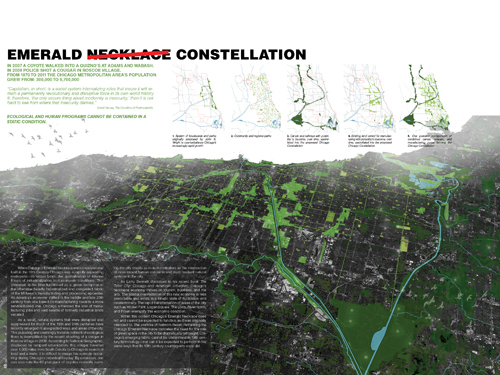 What if the open space becomes an active layer and not just a passive one? 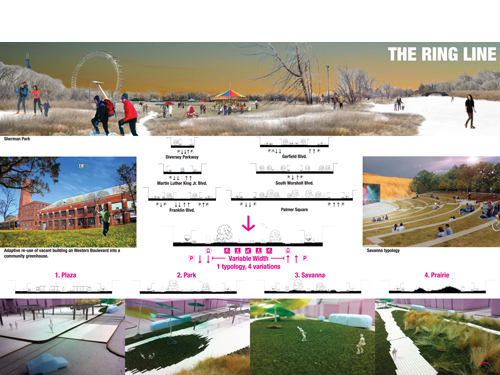 What if this system provides activities that the city as a whole is lacking? What if the system becomes a tool for social cohesion? What if the system has a strong visual identity? 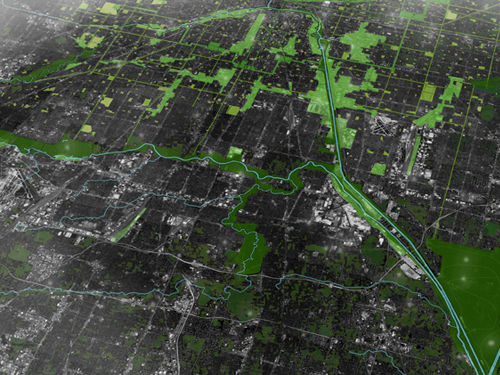 What if it becomes an economic catalyst for the neighborhoods? What if the system is all of this and more? 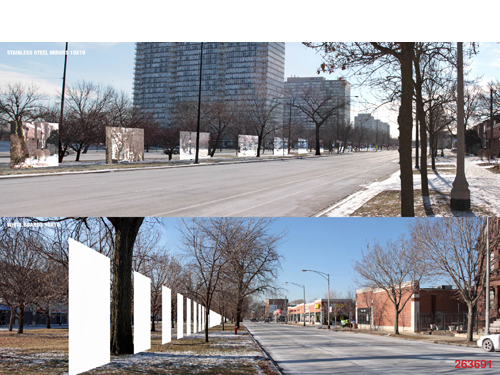 In the end, through images, diagrams and drawings, designers were asked to share their soft or hard, big or small, temporary or permanent interventions that could reactivate and reset the Boulevard System of Chicago. Before the competition deadline by the end of February, we received entries from Chicago, but also from other cities in the US, Canada, Mexico, Brazil, Belgium, Italy, Russia, Serbia, Spain, Sweden, China and Australia. In early March, a jury reviewed, first individually and then collectively, all the submitted entries. 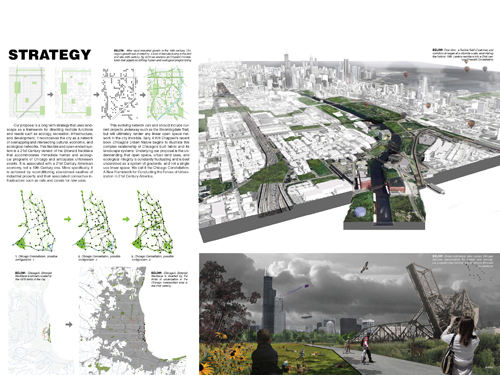 In order to approach the entries and system itself from different perspectives, the jury was formed by Jeffrey Sriver (CREATE Program Director, Chicago Department of Transportation), Paul Preissner (Partner, Paul Preissner Architects Ltd), Peter J. Kindel (Director of Urban Design, Adrian Smith + Gordon Gill Architecture LLP), Peter L. Osler (Director, Program of Landscape Architecture, IIT), Sally A. Kitt Chappell (Architectural Historian and Author), Sarah Dunn (Principal, UrbanLab), and Timothy Brown (President, Chicago Architectural Club). During the collective review, a series of interesting conversations between the jury members emerged from the different proposals. 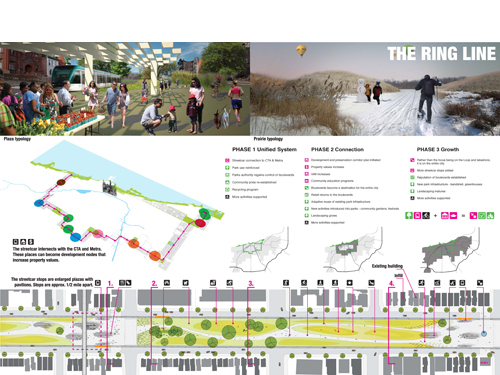 While some entries opted for an intense programming of the existing system visualized with evocative images, others incorporated new transportation systems such as dedicated bike lanes and light rails. 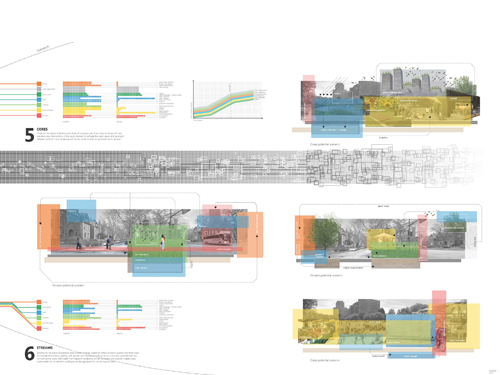 A third category, unexpected and provocative , was the objectification of the system, a way to recognize visually and market economically the Boulevard System. In the end, it was evident the complexity of the System but also the immense opportunities that it holds. 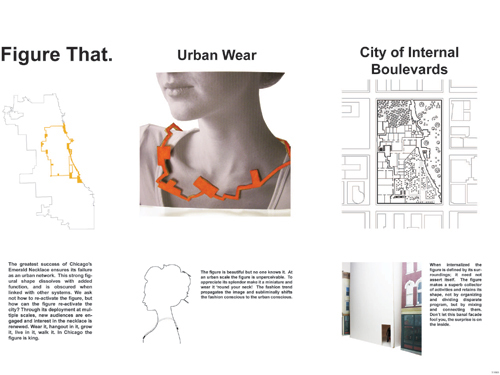 Building upon the effort of this competition and inspired by the excellent quality of the entries, we hope that a fruitful discussion is generated in Chicago around the Boulevard System. Lectures, panel discussions, workshops, visits and interventions should follow this competition to reactivate and use to its full extent this incredible asset of the city. The Chicago Architectural Club was founded in 1885 as an architectural sketch club. 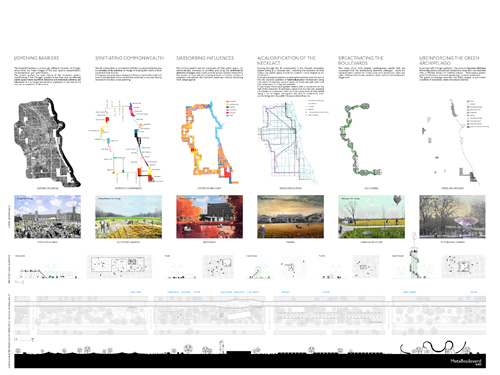 The CAC has consistently championed the work of Chicago architects, as well as fostering ongoing, vigorous debate on fundamental issues of art and practice with discussions, competitions and exhibitions. Today, the CAC has rededicated itself to carrying forward Chicago’s robust architectural legacy into a new century.